The basic configuration of the station had been predetermined by David R. George, the writer. There wasn't much wiggle room there. Andy, Deg (Douglas E Graves) and I are creative guys with our own ideas. I'm sure if left to our own devices there would have been three different and unique ideas. But we are also commercial artists. Our job is often to take a non-visual person's idea, sweeten, focus, massage... and then, hopefully, (provide) the proverbial happy ending. 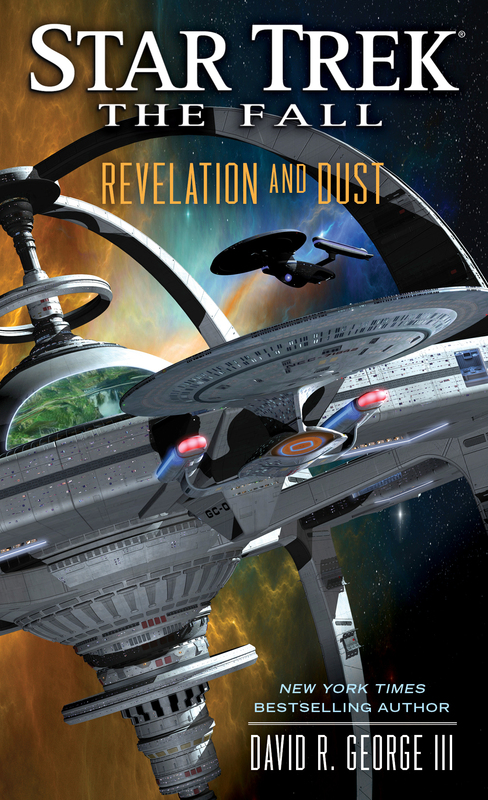 I love Federation and Starfleet design, so I liked the idea of a Starfleet-ized DS9. 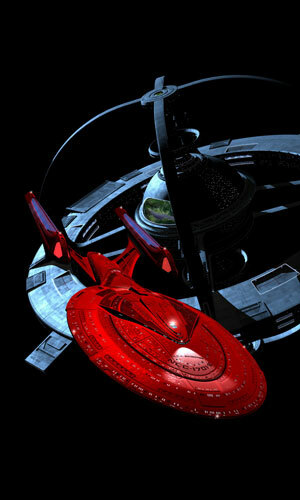 I also love Andy Probert and think that his visual sense for Starfleet is second to none. I had been given the option of styling David R. George's station design myself, but frankly, given the choice I'd much rather see what Andy would do. That's the fan in me. Andrew did the lion's share of lifting in regard to the styling of the design, no doubt about it. He drew up his sketches and even created a basic blocked-out Sketch-Up model of his design. With these in hand, I then created the high-resolution finished station configuration. The next phase entailed fleshing out the station detailing, which was based on Andrew's design sketches, combined with my own detailing choices drawn from my own Federation-based design sensibilities, which have become instilled in me over the many decades of watching Star Trek. I shared work-in-progress renders along the way with Doug to garner his always-valued input, and then his final approval of my build and paint-job. I love the whole station, top-to-bottom. At the core, I just love the Federation neo-flow take on such well-known classic lines. Just to see Andrew's sketches was a fan-rush. To see it fully constructed; wow! I love the magnetic rings, the new promenade, the huge environmental recreational dome, all the bays, portholes, landing pads, detailing, all of it. I loved rendering her out and then just looking at her as a fanboy. 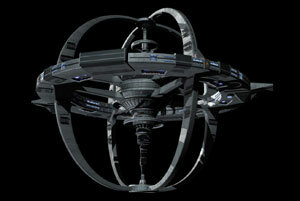 The design conveys one sleek and busy Federation space station, as it should be. The magnetically-suspended defense rings (top and bottom), the overall size, and the very open-to-space glassed-in promenade. 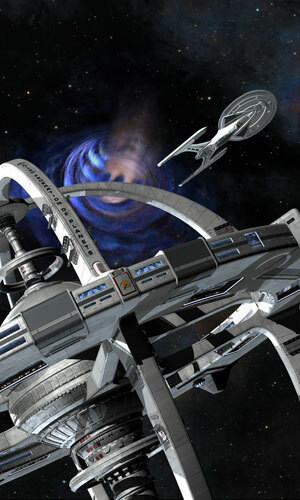 See StarTrek.com, for the full interview with Doug Drexler, and Andy Probert and Douglas E. Graves.